Attending the Jewel Award: Santa Barbara Palms wins the Tax Credit Property Community of the Year! 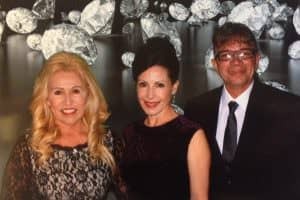 This year, Marina Adamy of GGI, Lori Muehlhausen of Silver State Housing and Angel Rivera, Manager of McKnight Senior Village, attended the 9th annual Jewel Awards, sponsored by the Nevada State Apartment Association (NVSAA). 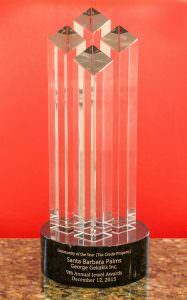 This year’s event, “A Diamond in Disguise”, was held at the Rio All-Suites Hotel and Casino, The event honors the best in various facets of the multi-family industry, including categories such as Leasing Consultant of the Year, Maintenance Supervisor of the year, Community Manager of the Year and Community of the Year. John Huck of Fox 5 News and Caitlin Shea from HomeAid of Southern Nevada hosted the Presentations portion of the evening, which also featured a entertainment, a formal dinner, dancing and a raffle to benefit HomeAid of Southern Nevada. We are proud to announce that this year’s recipient of the Community of the Year Award for the Tax Credit Properties category is Santa Barbara Palms. Lori Muehlhausen accepted the award on behalf of the property. With all that has been going on in the greater world, sometimes we forget about being grateful for the good things that surround us, or that we are involved with, like working in our affordable housing industry. The opportunity to make a positive difference in the lives of our Seniors or people with very limited means is an extremely rewarding experience. We appreciate the acknowledgement that Santa Barbara Palms has created an environment where people can live a better life! A division of the National Association of Home Builders, the 55+ Housing Industry Council is the voice of the Senior Housing industry and a leading source of information and research on the active adult, independent living, service-enriched and assisted living markets. At its annual International Builder’s Show (IBS) held this year in Las Vegas, NV, the NAHB featured its annual “Best of 55+ Housing Awards”. We are pleased to announce that Madison Palms garnered a Silver Award for its category, “Affordable Rental Community—On The Boards”. Madison Palms will bring 126 more units of affordable senior housing to City of North Las Vegas when completed. The last several years have seen a surge in rental demand, with 43 million families and individuals now living in rental housing across the country since mid-2015. This is up nearly 9 million from 2005, the largest gain in any decade recorded. The downturn in both the economy and the more recent renewal of the housing market fueled this statistic, extolling the benefits of renting. Also, the aging of Millennials, those born from 1985-2004, has added to the number of renters, as Baby Boomers (ages 51-70) continue to downsize and rent rather than own. But rental stock has not kept pace, the rental market has tightening, showing vacancy rates now at their lowest point, and rent prices rising at 3.5 % annually, the fastest pace in almost 30 years. This is creating a situation where the “cost-burdened” renter pays more than 30% of their income for housing, and in many cases the severely-burdened are paying as much as 50% of their earnings, rising from 7.5 million households in 2001 to over 11 million by 2014. This has set another record. Seeing the need for more apartment development, and seizing the opportunity to build, many developers are erecting multifamily, yet renters find that due to higher construction costs, these units are not within reach. It’s nice to think that a more robust economy is allowing for more construction, but the tremendous need for affordable housing is not being filled. And, many renters who already live in apartments are seeing rents continually increasing, and having nowhere else to go, become cost-burdened. Interestingly enough, even households earning $30,000 to $44,999 now represent a cost-burdened group that has increased 37-48%, although their number was 10% in 2014.The situation for the severely cost-burdened has reached a critical point with the combination of higher rents and substandard housing. The Low Income Housing Tax Credit (LIHTC) program, of course, still remains the primary means of expanding and preserving the affordable supply; that is why this program is so important. But the number of additional units produced through LIHTC is lagging behind the need. So what is the answer? For one thing, policy makers need to consider the extent and form of housing assistance, but perhaps most importantly, they need to promote development of a wider range of option and in communities that offer quality schools and more job opportunities. Developers have had to be extremely creative in layering subsidies in order to do projects and keep rents affordable, but the complexity and requirements of these layered subsidies add costs. Yet, all level of government must capitalize on the capabilities of the private and non-profit sectors, listening to their experience “from the trenches”, so to speak. It is just this creativity and vision that will enable the affordable housing industry to make the leap to the next level for the industry. Greg Pike and Clarissa Milton, now part of the McKnight Senior Village team! 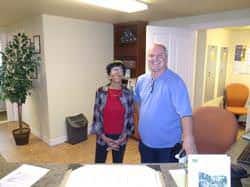 Through our non-profit organization, Silver State Housing, our properties offer opportunities for seniors to volunteer their time while gaining experience for potential employment in the general workplace, to brush up on their office skills in a friendly and helpful environment. AARP has been a helpful source for these seniors who want to work. Now and again, volunteers seem to fit the bill for employment at our properties when openings occur. Such is the case with Greg Pike and Clarissa Milton who joined the staff at McKnight Senior Village. Greg works as a porter, dividing his time between McKnight and our Santa Barbara Palms. Clarissa trained for and is now employed as McKnight’s receptionist. This quarter, we take the opportunity to tell the story of our Whispering Palms Apartments, a senior rental housing community of 208 units on 15 acres. 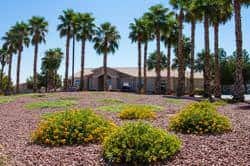 Opened in 2001, Whispering Palms features single-story apartments, 104 one-bedroom units and 104 two-bedroom units, and a large community recreational clubhouse. 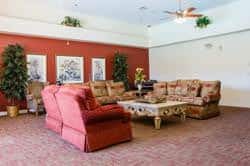 The club- house has full-kitchen facilities, outdoor pool/ spa, health room, exercise room, media room, game room with planned activities and outings offered. Health screenings and food distribution are coordinated by the resident manager working with our non-profit partner, Silver State Housing, to bring numerous supportive services to our residents. ￼￼Whispering Palms is located at 2655 West Lake Mead Boulevard, in North Las Vegas. 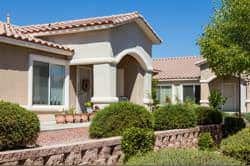 Just east of the major intersection of Lake Mead and Rancho Drive, the community enjoys access to retail, including a Walmart center, banking, health care, as well as two well-known local hotel/casinos, Texas Station and the Fiesta Rancho for entertainment and employment opportunities. Designed by John Burke Architects, the- se units resemble small homes, and the property exhibits water-conserving desert landscaping. Whispering Palms was financed with tax exempt bonds, allocated through Nevada Housing Division. Construction began in 2000 and the property was placed in service in February 2001. The property has enjoyed steady occupancy, all within a gated community that has become a fixture to the area. This Summer, Las Vegas Crime Free Multi-Housing Program put on a important event for the residents of Santa Barbara Palms, an educational presentation by Officer Leavitt from the Southeast Area Command. Designed to help tenants, owners and managers of rental properties keep drugs and other illegal activities off their properties, the program utilizes a three-part approach to insure crime prevention is maintained in an efficient and cordial manner. The property completed the three-phase course to obtain certification and to post the program’s signage and logo at the property as well as in advertising. Officers helped the property meet security requirements, urging residents and management to take a proactive stance in crime prevention. Silver State Housing provided refreshments, with a question and answer session to round out the day. During the Summer, food deliveries continued to all properties, as well as all-important health screenings. Silver Star Bus was scheduled for weekly errand trips. Also, monthly resident meetings were scheduled, where residents come together as a community to voice their concerns, make suggestions, engage with management. At Santa Barbara Palms, the calendar has included computer classes twice weekly, a craft class every Thursday, and birthday bingo. A resident-sponsored, Hawaiian-themed Pot Luck, and a popsicle social (above). Also, a twice-weekly shuttle to The Eastside Cannery Hotel and Casino continues, for dining, entertainment and sports watching. At McKnight Senior Village, Food For Soul, a faith-based class, has been offered each week, as well as a quilting class that has received good attendance. 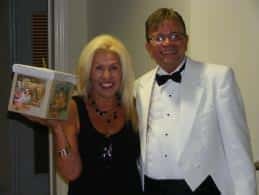 Residents helped plan a special 5-0 birthday party for manager Angel Rivera (shown above with Silver State Housing executive director Lori Muehlhausen), complete with fancy dress and décor. A great time was had by all! On a monthly basis, Clark County Library’s mobile van visits the property, issuing issues library cards, and assists residents to check out books, cd’s and videos, a helpful opportunity for those who have difficulty getting around. Sonoma Palms also continues its faith group class, meeting on Tuesdays, bid-whiz is scheduled twice weekly, bingo every Saturday mid-morning. The Eastside Cannery and Arizona Charlie’s buses come every Sunday for social outings. Residents at Sunrise Senior Village are still enjoying Movie/Popcorn Day, Bingo and Pokeno. They celebrated September birthdays mid-month, and hearing and balance testing was offered. 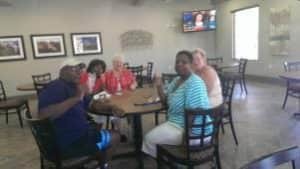 At Whispering Palms, bingo, Movie Day and a resident-sponsored Spaghetti Feed were on the Summer calendar. Our non-profit sponsor, Silver State Housing, has arranged free phones for residents. Also, Lori Muehlhausen recently attended the grand opening of the new Three Square Center, home to Las Vegas’ primary food bank and SNAP program (supplemental nutrition assistance program). Seniors who volunteer time at our properties were also invited to attend. “Their participation and input is critical for important senior issues,” remarks Lori. A crime-free property is good for business! Or at least taking a proactive stance to prevent crime is of major importance to the health and well-being of a multi-family community. Residents who take an active part in protecting their homes is essential, and owners and their management can help the process with education. Crime prevention seminars and discussions help give residents the tools they need to recognize acceptable or troublesome conduct on site. Seniors in particular can be targets of abuse, and programs such as National Night Out and the Crime Free Multi-Housing Program help residents and local police work together to recognize problems and how to deal with them effectively. Quick-fixes and temporary measures such as hiring a security patrol for a few months only yield temporary results. Without long-lasting changes to the environment the crime problem returns when temporary measures are terminated. It is only when everyone works together that continued, positive results are ensured. A good plan for safety and security is designed to integrate into the daily routine of management. Partnering with law enforcement is the most effective method to prevent crime, and in turn, properties benefit financially and psychologically. When a property is safe and sound, it attracts good tenants. Good tenants tend to abide by the law, pay rent on time, sign longer leases, maintain their residence, watch out for each other, and retain a pride in the development. It is a win-win for all concerned.